During the development process of a product or system, it is important to verify whether the prototype actually meets all the wishes and requirements. This can be achieved by conducting extensive tests. There could also arise a situation where existing products or even one of their parts must be tested in order to identify problems, make improvements or create a basis for new developments. 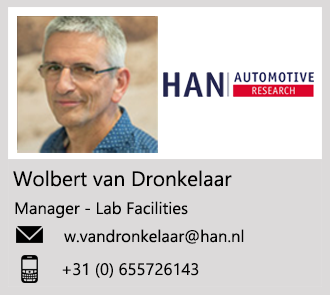 HAN Automotive Research can assist companies in carrying out reproducible tests of vehicles, components or vehicle systems. Testing may focus on functionality, durability, validating models and theories or on gaining insights into the performance of a vehicle or system. Important test sectors are energy and fuel consumption, emissions, system efficiency or electric drive, vehicle dynamics, NVH levels, durability, dimensions and tolerance, performance of control systems, strength and stiffness tests. HAN-AR has an enormous know-how knowledge and an extensive laboratory, which is equipped with high-quality, specialized equipment and necessary software. Tests are systematically set up at HAN-AR. The basis is the test plan, in which the test method, the measurement method and the test set-up are recorded. An important aspect of this plan is also the determination of the measuring ranges and the accuracy of the measurements, as well as the resulting significance of the results. Furthermore, the boundary conditions and the way of data acquisition and data processing are recorded in the plan. After the measurements, the data is analyzed and interpreted by HAN-AR if desired. HAN-AR is also able to draw conclusions based on this data and can provide technical advice on the basis of this information. Science is of paramount importance at HAN-AR. This guarantees that tests at HAN-AR are carried out objectively, independently, reproducibly and well-founded. HAN-AR is always confidential and safe with your data. Thanks to the high level of knowledge, the excellent and versatile test facilities and the strength that is created by the joint efforts of teachers and students, HAN-AR is a very suitable test partner for companies in the automotive field.